The key to setting up a successful aquarium is to quickly convert the fish waste to a non-toxic form. This is done by nitrifying bacteria. Under normal conditions it can take 30 to 45 days for these bacteria to become naturally established in a newly set-up aquarium. Unfortunately, during this time period, ammonia and nitrite can increase to levels toxic to fish a common problem called New Tank Syndrome. 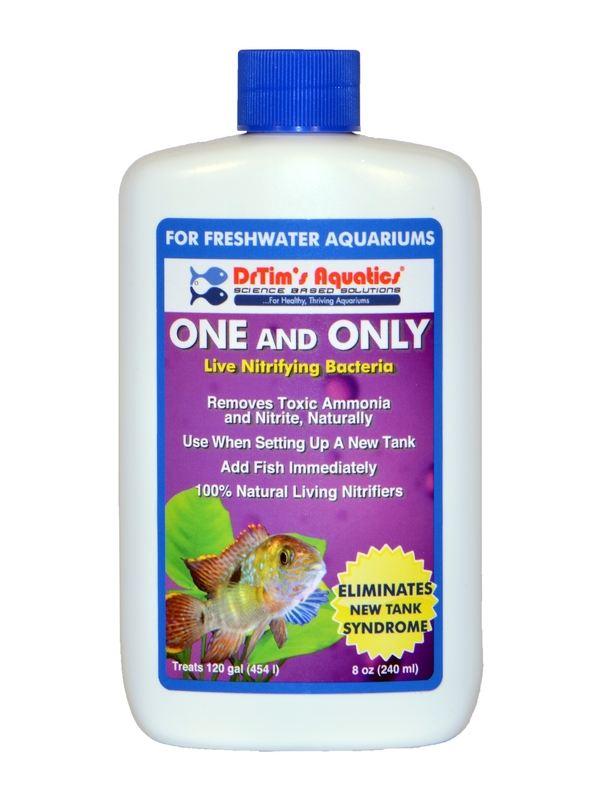 DrTim's One & Only Nitrifying Bacteria are the result of the latest scientific research and are used by public aquariums and professionals around the world to control ammonia and nitrite. Four weeks into a fishless cycle using Dr. Tim's one and only bacteria and ammonia product as directed. Still not cycled. Ammonia level has stayed steady at 2ppm for weeks without adding more. I had an urgent need to set up a new tank: my platys had bred so enthusiastically that I was facing a Mathusian crisis in my main tank. So, I set up a 10g tank and transferred many of the juveniles to it to grow a bit before taking them to my LFS. They'd be overcrowded as adults, but I figured juveniles wouldn't be much of a problem, as I was using another company's product to establish a biological filter. I was wrong. A few days after movign the juveniles, and having followed the other company's instructions to the letter, I tested ammonia and found a reading of 0.5. Danger signal. So I bought a 2 oz. bottle of "One and Only" and added it to the tank. Tested the next day, the ammonia read 0.25. The day after that: 0.0. I'm very impressed. Near as I can tell, Dr. Tim's really does establish a sufficient biological filter right away. I'll be sure to use it again when I set up my next tank. I LOVE this stuff! It has help me keep my water parameters in check after doing water changes and after serving my filters. I add a capful per 10 gallons and my ammonia, nitrite, and nitrates have always been in check. My fish are very active and I am very happy! The only thing I have to say is that this product is rather expensive and something you don't want to waste. Other than that I now tell people about Dr. Tims and why they should use it! Thank you Dr. Tim! One & Only is the only Freshwater Aquarium Bacteria Supplement that I could find that actually works. Bought several others that only had dead cesspool sludge, waste of time and money. EXCELLENT product. Fullfilled all my expectations. High quality product. Helped to expedite the cycling of my tank along with Dr. Tim's liquid ammonia. Had just cycled a 50 gal tank and had 4 - 10 gal to cycle--and was not looking forward to it. Then I heard about "one and only", so I figured it was worth a try. Set up 4 10 gal and added One & Only as directed, and nervously watched if my fish made it. Checked each tank every day and was pleasantly surprised at the results. Would have no problem recommending it. Thanks Dr Tim. I like many have been disapointed with bacteria in a bottle products in the past. I tested a few recently. This was the only one that definatly started working within 24 hours. Tanks were clear within 72 hours. I was using a fishless cycle at 85 degrees F.
Been trying to fishless cycle for a couple of weeks. Used a bottle of the One and Only and my cycle kicked in right away. Ammonia went to zero by the next day, NitItes spiked and went to zero after that. Worked as advertised. I tried other products that claim to instantly cycle and they did nothing. I used this to speed up the cycle. I quickly got a Nitrite reading and in a few days, an increasing Nitrate level. Not 100% sure if it was the product or nature. Bottom line - it's worth a try! Worked as advertised. Tank cycled in 3 or 4 days. added 3 fish a week for 3 weeks and tank is still doing great. 0 ammonia and still 0 nitrite!! Thanks Dr. Tim. Will definitely use it again. you have to try it i use it to boost the biofilter after filter mant. YOU NEED TO TRY IT YOU WONT BE SORRY. WOW!!! it works great well worth the money.I had trouble with ammonia not any more i plane to buy more ASAP!!!! I read a lot online about the fishless cycle and was curious about trying it out. I read about the benefits of Dr. Tims One and Only and decided to give it a try on a new 60 gal. tank. I must say, I was not disappointed, 14 days later my tank was fully stocked full of beautiful fish. So far I am 4 days in and have not had any spikes in Ammonia or Nitrite. I am very impressed with the speed in which I was able to cycle my tank. Thanks so much for a great quality product. I just set up a system at my office. As I'm not the most patient person in the world, I wasn't excited about a 5-6 week cycling period. I used the product and in 2 weeks had a tank full of Africans and no new-tank issues. Great product! I'm a bacteriologist; so, I'm happy to be able to recommend this product because it always has worked very well for me. I think it's a good example of "truth-in-advertising," as long as it's stored for optimal stability in the refrigerator. I have used this product twice now when setting up my 125 gallon tanks. Both times I added a good number of fish the next day after adding and had no ammonia spikes in either tank. Thanks Dr Tim for producing a product that actually works as advertised. I did the fishless cycling with this product and in less than a week my 240g tank was completely cycled. Ammonia -0 Nitatres -20 Nitrites -0 Great product, will use again. I started the cycle on my 125 gallon tank only 8 days ago. It is already cycled. Ammonia and Nitrite levels at 0.00 after about 20 hours the last 2 days. One and Only is exaclty what Dr. Tim said it would be and just as easy to use. They even sent Ammonia to use free of charge. I will use One and Only from now on.